This woman looks about as uncomfortable as any person I have ever seen in my entire life. 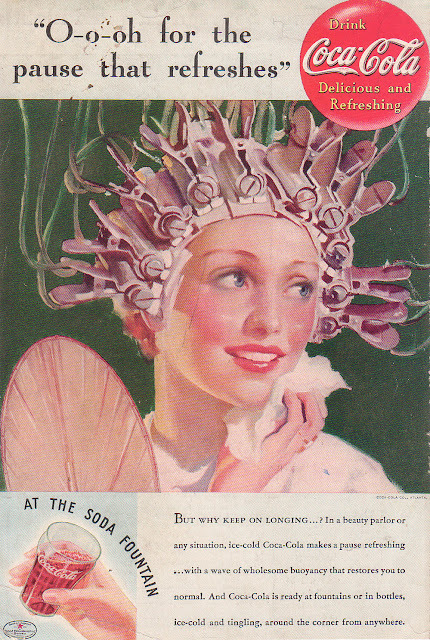 It’s terrifying to think how much electricity is flowing through the electric hair curlers in this 1935 advertisement for Coca-Cola. I, for one, am glad that firstly, men are not subject (at least in general) to such tortures and secondly that women… well… woman only get tortured on this scale once a month or so. O-o-oh for the pause that refreshes. But why keep on Longing…? In a beauty parlor or any situation, ice-cold Coca-Cola makes a pause refreshing… with a wave of wholesome buoyancy that restores you to normal. And Coca-Cola is ready at fountains or in bottles, ice-cold and tingling, around the corner from anywhere. We’re to believe that the product will be so refreshing that it almost makes you float on air! Go to your local soda fountain today and get some! If, that is, you can find a soda fountain. So would you buy this product based on this ad? Does it make you feel positively about the product? More importantly, would you have your hair done with such a contraption?